My dad, a professional meteorologist, would sometimes bring a weather balloon home for us to play with. I was captivated at how, being lighter than air, it could rise to the ceiling above me. I remember watching him release a weather balloon into the atmosphere. It was a pleasurable, even emotional experience as it rose higher and higher, then disappeared from sight. Nowadays balloons are launched in other ways. They are used in a celebratory manner, at weddings, birthdays, and memorials. Several years ago as I watched the news, helium filled balloons were let go to honor each man killed in a West Virginia coal mining accident. Once out of sight, I wondered where those balloons might end up. One thing for sure, eventually they would come down to earth. 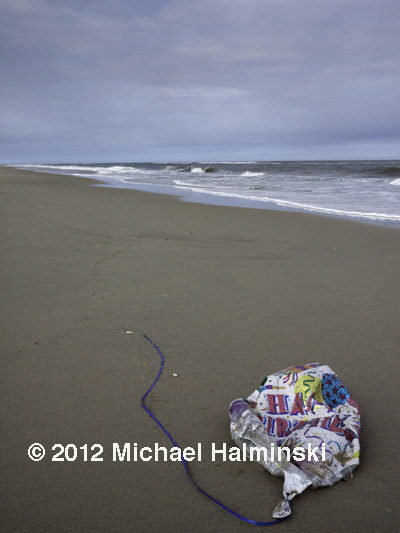 Derelict balloons often end up as litter on our beaches. 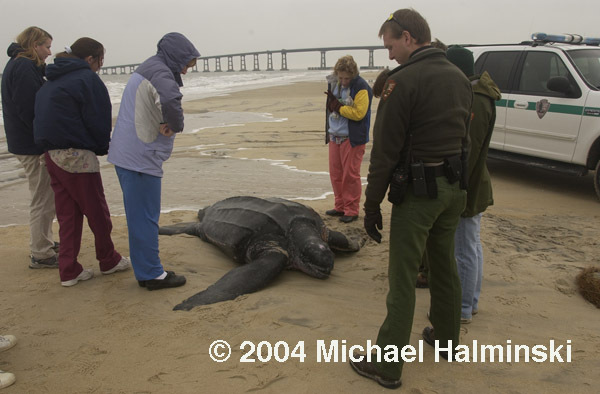 In January 2004, I saw a big leatherback turtle that had washed in at Oregon Inlet. The thousand pound reptile was just barely alive. On the scene were National Park Service personnel, two sea turtle biologists from the North Carolina Wildlife Resources Commission, and a local volunteer veterinarian. It was determined that the animal could not be saved, and that the best approach was to euthanize the creature. It was a solemn moment, as the lethal injection of sodium pentathol was administered to the turtle. 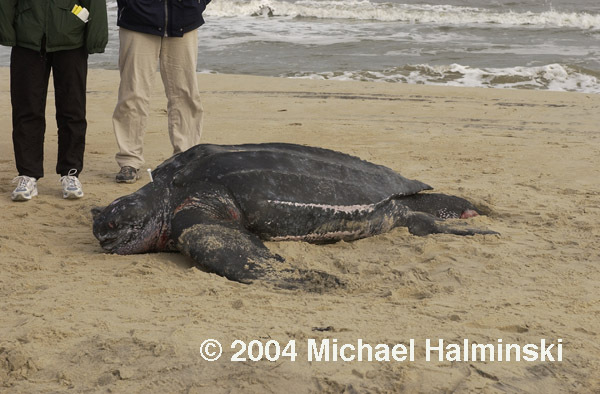 In a few minutes, the leatherback lay lifeless on the sand. State biologists Wendy Cluse and Matthew Godfrey wait as the leatherback, with syringe in its neck, is euthanized. A necropsy revealed the sea turtle had ingested something resembling its natural food of jellyfish. The culprit was a once helium-filled balloon that had fallen back to earth. The errant balloon lodged in the digestive tract, making it impossible for the turtle to feed and stay alive. I keep this image hanging on my studio wall, and it gets a lot of reaction from visitors. I try to educate folks that those soaring balloons descend to earth, always become litter and sometimes killers. This entry was posted in Outer Banks, Sea, Wildlife on July 23, 2012 by j0jgvm89bj.